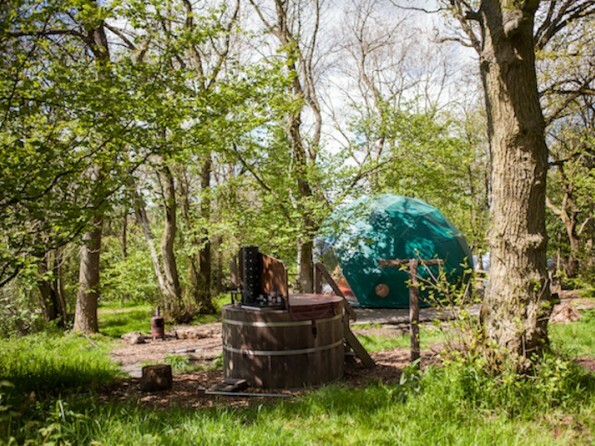 The award winning Cosy Under Canvas glamping site is in a small and beautiful woodland close to Hay on Wye on the Welsh borders. 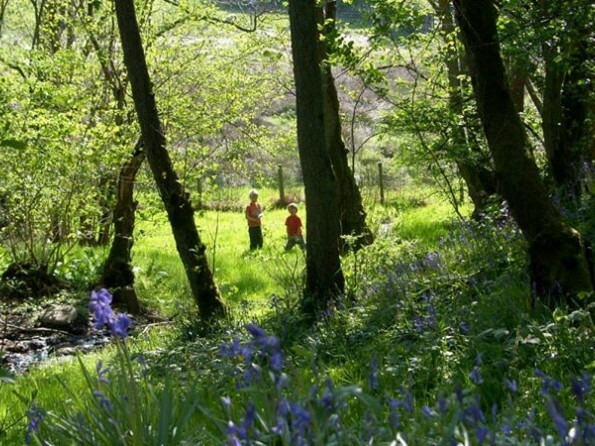 It is on the Brecon Beacons National Park and surrounded by open countryside. Even a short stay here offers the perfect antidote to a busy hectic lifestyle. Perfect to satisfy a craving for the outdoors with no compromise on comfort. 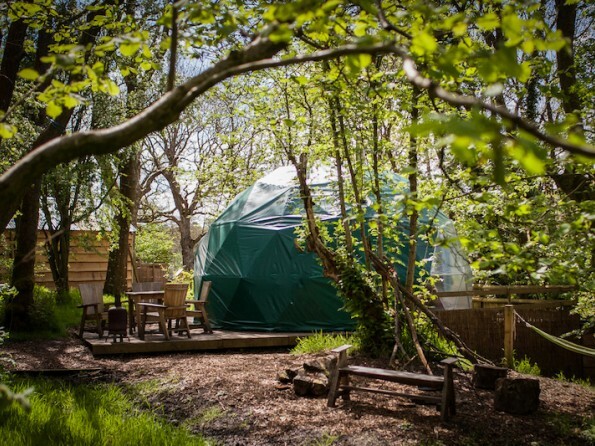 There are 7 geodomes, all on decking with wood burning stoves and private fire pits. 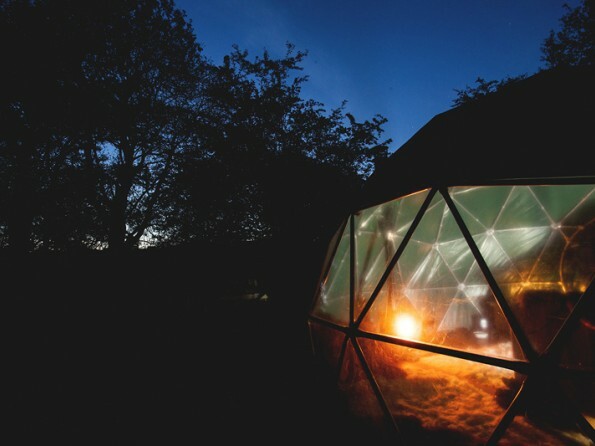 The domes each have exclusive use of a wood-fired hot tub, perfect for steamy nights under the stars. 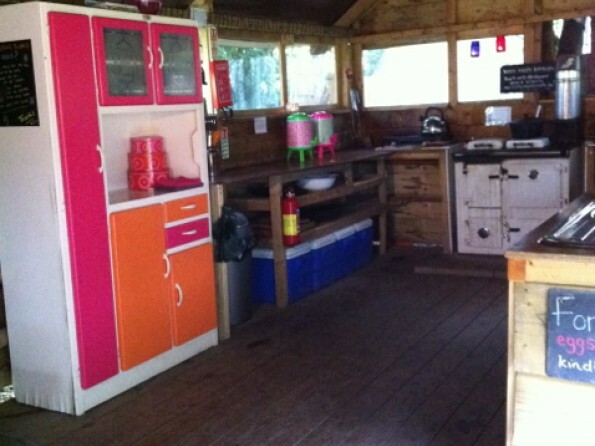 Our Glamping site has plenty of communal space - the Cosy Lounge provides a great space for communal socialising, relaxing with a book or perusing the local maps and information. In the large communal kitchen there are gas stoves, cool boxes, food storage boxes plus all the cutlery, crockery, pots and pans that you could need for your stay. Park yourselves round the large table and read the papers or a short story, enjoy a game of cards or just chat the day away. It’s peaceful, relaxing and comfortable.The sky is dark and the stars are bright. 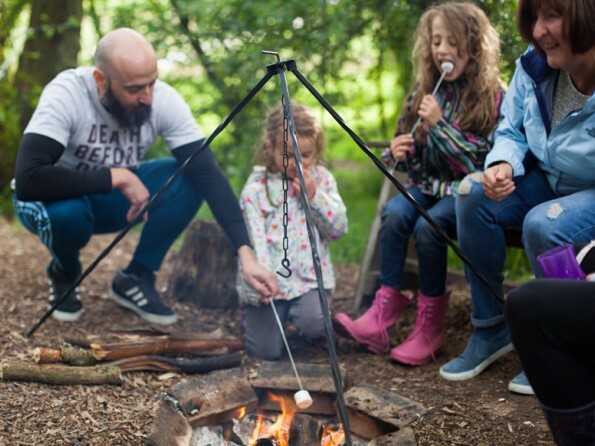 From woodland swings and stream-dipping kits to personal toiletries and real coffee, we’ve thought of everything to get you back to nature in style. 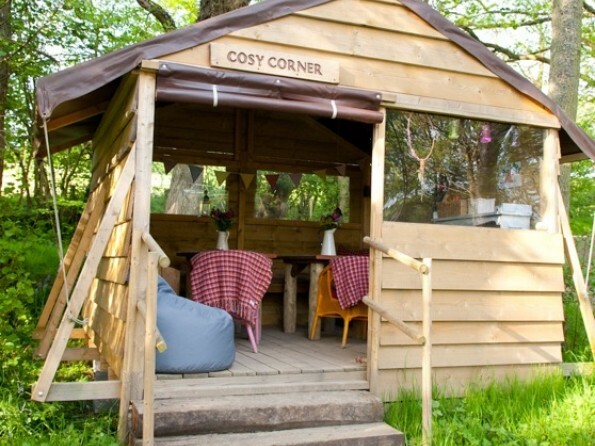 Within a mile of the Offa`s Dyke path that forms the border between England and Wales, close to the Begwyns National Trust common land and adjacent to a footpath and bridleway, the Cosy Under Canvas site is an ideal glamping retreat for those seeking a base to explore the area. The unique market town of Hay on Wye with its mass of bookshops is only four miles away and the opportunities locally for outdoor activities are endless; hiking, walking, horse riding, trekking, canoeing, cycling, climbing, gliding and caving to name but a few. The site is just outside the town of Hay on Wye. Detailed directions provided on booking. 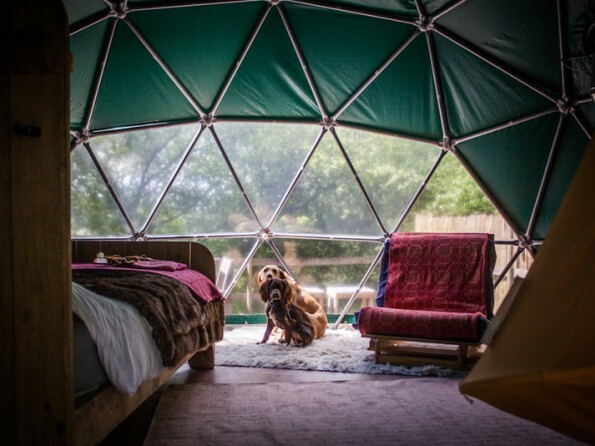 The spacious domes are 6m in diameter and 4m high and sit on a wooden platform. They can sleep up to six adults, two on a comfy king bed, two on double futon beds and two on roll out futon mattresses. Cosy duvets and crisp cotton bedding are topped with luxurious, contemporary welsh blankets, throws and sheepskins.. 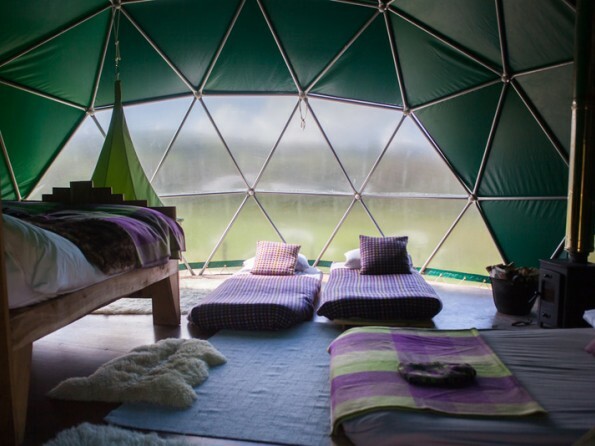 The smaller domes are 5m in diameter, sit on a wooden platform and comfortably sleep four adults, two on a double bed and two on roll out futon mattress. All beds have extra comfy memory foam toppers and are covered with contemporary welsh blankets, throws and sheepskins. 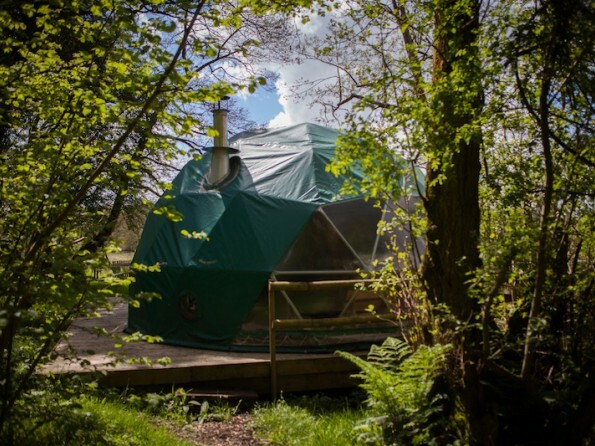 To complete the cosy glamping experience all domes have a wood burning stove that heats the the inside up in no time to keep you warm and toasty. 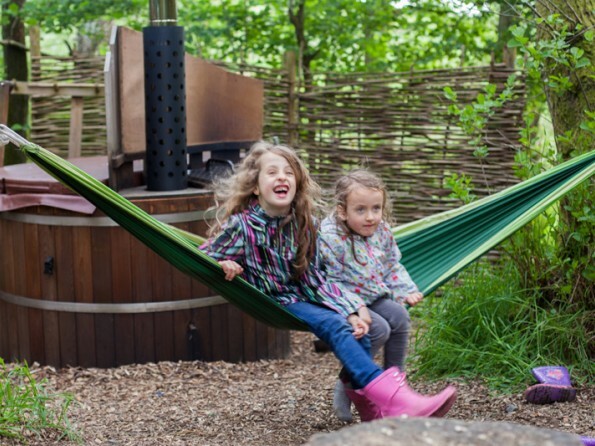 There's a recycled gas bottle chiminea on the deck of each dome - great for toasting marshmallows or even your toes after an adventurous day out. Or to complete your glamping experience, build yourself a roaring fire in the pit in front of your dome. 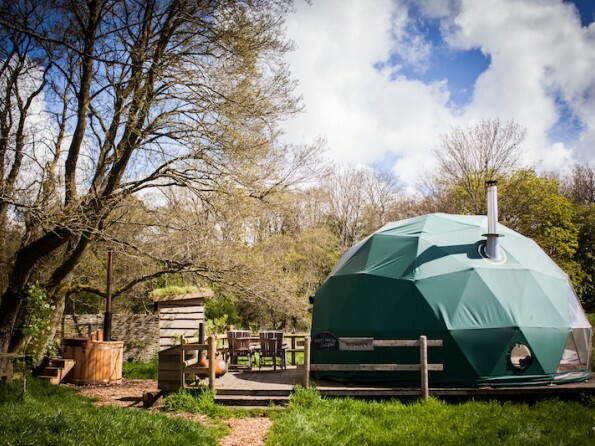 All of the domes have exclusive use of wood fired hot tubs for steamy nights under the stars. 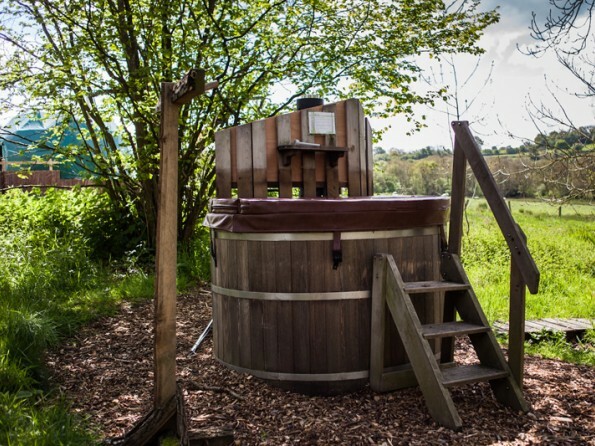 There are also private compost loos, wood fired showers and for the more conventional, an electric shower a short walk away. Prices are per night, based on 2 people sharing. Extra adults @ £40 per night. Extra children @ £10 per night. You are welcome to arrive any time after 4pm and check out time is 10.00am. 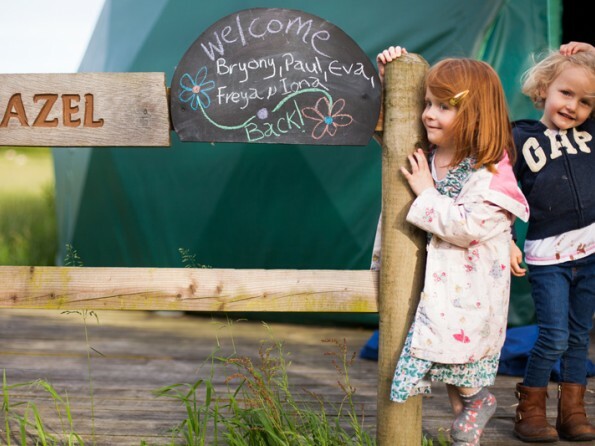 Tea, coffee, sugar and milk are provided on arrival so that you can enjoy a cuppa while you unpack and familiarise yourself with your dome and new woodland glamping surroundings. Well behaved dogs, with their own beds are welcome by prior arrangement, at a small extra charge.